DONATION DROP-OFF DOOR AT THE NORTH END OF THE BUILDING. Donations of all kinds are accepted. Please see the exclusion list inside the store office. The store has a large variety of goods for sale. Items include clothing, furniture, appliances, art, jewelry, collectibles, house wares, linens, books and records, building supplies, TV’s, stereos, computers, and much, much more! Because of the generous support of the local community, the WHITE ELEPHANT THRIFT STORE can offer quality merchandise at very affordable prices for those on a limited budget or just looking to get a great buy on one-of-a kind items. The 34,400 sq. ft. store is located in Green Valley and the heart of the Santa Cruz Valley. Our volunteers take great pride in keeping the store neat, clean, and well-organized so that customers enjoy their shopping experience! Unsold items are given to the Salvation Army, St. Vincent de Paul, and other needy charities. White Elephant Volunteer Truckers start their work day before most people are awake! The entire truck crew is made up of some very hard-working retired guys. These are guys who could be spending their time out on the golf course, maybe taking a hike, or even just sleeping in, but instead they are working on the White Elephant trucks. They give their personal time to do heavy lifting, moving furniture and appliances, and picking up everyday household goods that are donated by community residents who so generously support the White Elephant. The job of a trucker doesn’t stop at the front door to a residence. Our truckers typically move furniture in or out of homes where residents just could not do it on their own. The White Elephant is honored to say that we receive numerous calls, letters, and emails from local donors paying compliments to the great job that our truckers do. We are fortunate to have a crew of volunteers who don’t mind getting up and starting their day before the sun rises. 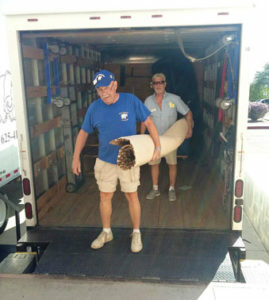 Our crew is responsible for picking up large donations and delivering customer purchases to local residents from Green Valley to Sahuarita to Tubac and Amado. White Elephant trucks go out six days a week and can be driven hard on short runs. Keeping the trucks running and in good working condition is the job of Volunteer Truck Manager. The manager keeps the trucks well maintained and is in charge of scheduling regular service and repairs to the trucks. With the help of fellow truckers they keep the trucks clean and stocked with the equipment that helps truckers with the daily job of picking up a variety of donations and delivering furniture and large appliances to local customers . If you attend this year’s annual White Elephant Parade, you will also see our trucks driving down La Canada as part of the festivities. It is the one Saturday each year that our truck crew does not go out for donation pickups. We are always in need of additional volunteers for the truck crew. If you think you might like to become part of the White Elephant Truck Crew, please contact our Office Coordinator and Truck Scheduler, Susie Sierra at 520-625-4119. Susie can assist you in becoming a White Elephant trucker.